One of the things I love about living in the DC area is the cultural diversity. There are folks here from all over the world – immigrants, temporary workers (embassy personnel, for example), and visitors. This influx of people makes the cultural scene really vibrant, but it also greatly enhances the culinary scene. I absolutely luuuurve Mexican food. I grew up in Oklahoma, so I was raised on Tex-Mex, but once I moved to Atlanta, I tasted the real deal and never looked back. It’s the same in metropolitan DC. There are tons of Mexican, Salvadoran, Peruvian (and on and on) restaurants here, and the food is delicious, but my first love remains Mexican cuisine. In the last few weeks, I’ve eaten in three Mexican restaurants in the Arlington area. Now, if you’re going to compare restaurants of the same genre, I think it’s important to set a baseline. What can you use to judge the restaurants across the board? When it comes to Mexican food, my baselines are beef tacos, chicken enchiladas, and – most important – margaritas (on the rocks, with salt). First, the beef taco. Is the beef shredded or ground? In my experience, with shredded beef, there’s a greater probability of finding fat in the meat. That’s a deal-breaker. I also don’t like the beef/filling/shell ratio with a shredded beef taco. Too often, you bite into the taco and this big hunk of shredded beef trails after you. Uncool and unsightly. So, points off if the restaurant makes a taco with shredded beef. I prefer ground. Next, the chicken enchilada. Is the chicken diced or shredded? Oddly enough, I kind of prefer the shredded chicken. The fork can cut through the chicken, so no worries about unwanted trails. I also think that with the diced chicken, you have to beware of fat or gristle. There’s nothing worse than biting into a piece of chicken and hitting gristle. Except biting into a shredded beef taco and hitting fat. Finally, the margarita. I cannot stress its importance enough. How big is the glass? How much ice is in the glass? Too much ice waters down the drink. Is it strong enough to make you feel happy but not so strong as to block out the yummy taste of lime and sugar? Is there a nice, thick ring of salt on the rim? Uncle Julio’s: I have fond memories of this place. When I first moved to the DC area, I lived in a corporate apartment just down the street from this restaurant – so I ate there quite often with friends. If the constant crowds are any indication, people love this place. The food is terrific. On my last visit, I had one beef and one chicken enchilada. Yum. But the margarita was sub-par. It was extremely watered down – sort of like someone in the back made a pitcher of margaritas, added ice, and the ice had started to melt. Really disappointing. Taqueria Poblano: my friend Nona loves this restaurant. She swears by the chicken tortilla soup. On the day that I ate there, I had a beef taco. Shredded beef, so automatic deduction. No fat deposits, but a lot of beef trails, which was disappointing. Also, the margarita was way too strong. It was like a glass of tequila over ice. Now, there’s nothing wrong with really good, high quality tequila that’s meant to be sipped – but this wasn’t it. My experience wasn’t good enough to make me want to go back, although I’ll probably give the chicken tortilla soup a try based on Nona’s recommendation. El Paso – I’ve heard former President George W. Bush is a fan, which would usually be enough to turn me off a place, but I love this restaurant. The food is DELICIOUS. To be honest, I can’t remember if the beef in the tacos is shredded or ground, but I’ve never had a meal here that I didn’t absolutely love. The margaritas are fantastic. A perfect blend of liquor, ice, margarita mix, and salt. My Spanish teacher, a native of El Salvador, agrees with me about the margaritas. She thinks they are the best. I love this place. So the clear winner in my book is El Paso, but really, all three are worth a visit. Maybe you like your margaritas stronger than I do, or maybe you prefer shredded beef to ground. None of them will disappoint. Oh and P.S. – please, no comments correcting my Spanish (you know who you are). I’m doing the best I can here! It’s springtime in Washington! Wonderful weather for a wonderful walk with my fantastic friend, Nona on Roosevelt Island. Che bella passeggiata! 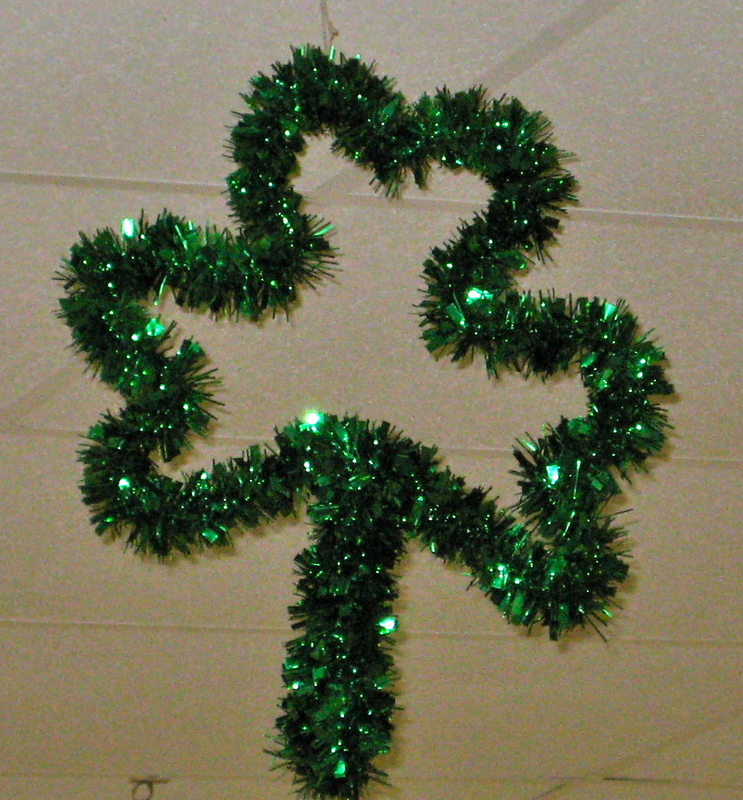 I have to admit it: I’m not someone who gets deep into celebrating St. Patrick’s Day. I have no great desire to go to a parade, or drink green beer, or whatever else. The one thing I will do, however, is wear green. And I feel real pressure to do it. Especially when I’m overseas. Like the people in whatever country I’m in NEED to know that Americans celebrate St. Patrick’s Day. Uh huh. But this year, I did celebrate – albeit a week early. My sister and brother-in-law (henceforth known as my BIL because I just do not feel like typing “brother-in-law” for the rest of this post) invited me to join them at a St. Paddy’s Day dinner hosted by their local Knights of Columbus chapter. I heard that KofC knows how to party, so I decided to go. I arrived a little past “fashionably late,” which was a problem because the diners had already worked their way through the buffet table. I had no idea that senior citizens and cute little kids were so crazy about corned beef and cabbage, boiled potatoes, and salad. Fortunately for me, they left me a few scraps. More importantly, the bar had not run out of Guinness. Brief story on my introduction to the wonders of Guinness. When I was posted in Albania, I went to Ireland on vacation with some friends. The day after we arrived in Dublin, my friend Dave and I decided to visit one of the local pubs and have a drink or two. Seeing as we were in Ireland, we both ordered Guinness – draft, of course. Now, I’m more of a wine-drinker than a beer-drinker, but I feel in love that afternoon. I loved the dark flavor, the heaviness, the warmth of it. That is one excellent beer. What I learned upon returning to the States, however, is that Guinness out of a bottle or a can pales in comparison. That stuff is just crap. So I only drink it if it’s on tap. Fortunately for me, the beer was on tap at this little shindig. The entertainment for the evening consisted of an Irish band and Irish dancers. It was during the dance performance that I had an epiphany. There is a north/south divide in our world that is demonstrated through dance. Compare Irish dancing (north), in which the legs and feet move while the upper body remains stiff, to salsa or merengue (south), in which the entire body is engaged. One is “cold,” the other “hot.” One is controlled, the other fluid. I’m not sure of the exact latitude that serves as the dividing line between “hot” and “cold” dancing, and I’m not trying to disparage Irish dancing or say that one dance is better than the other. What I am saying is that I’m pretty sure there’s a way to solve all the world’s problems here. Peace is just a dance step away. What if Ahmadinejad danced with Merkel? Or Lukashenko with Mandela? Berlusconi with…okay, given his current legal problems, Berlusconi probably shouldn’t be dancing with anyone, but you get my drift. Let’s get ’em all on “Dancing with the Stars!” This could be horribly awesome or awesomely horrible. Either way, I’m good. Of course, I’d had a beer or two by the time I had this revelation, so….maybe not. Hey, I’m not usually one to hit the clubs after work on a Friday night – especially after the week I had this week. Sheesh! But the Monsoon Club was too good to pass up. What’s the Monsoon Club? I’m so glad you asked! The Monsoon Club is part of the month-long “Maximum India” event at The Kennedy Center. The KC Jazz Club on the Terrace Gallery was redesigned as an installation piece and a performance space. The installation is meant to inspire a moment in a downpour: nearly one million raindrops frozen in space. 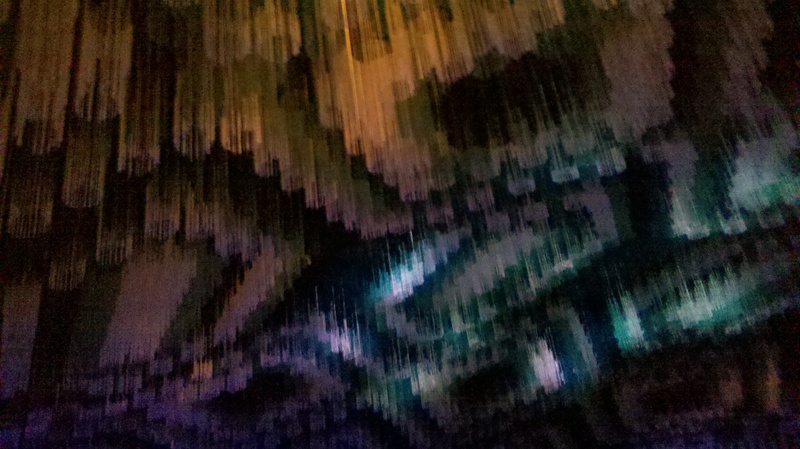 This photo doesn’t do it justice, but it was really quite beautiful, and created a feeling of intimacy in the club. Last night, the Indo-Pak Coalition performed in the club. Rudresh Mahanthappa on alto saxophone, Rez Abbasi on guitar, and Dan Weiss on tabla and drums. The music was jazz, infused with Indian influences. Quite a treat. In addition to performances in the Monsoon Club all month, Maximum India offers Bollywood films, discussions, arts and crafts on display, an amazing jewelry exhibit, and much more. If you’ve ever wondered about Indian art, culture, or music, you should check this out. My friend, Joan, told me that Julia Roberts is a big knitter, so there’s hope for me yet! On Sunday, I successfully advanced to “Stage 2” spinsterhood. Or something. I took a class at my favorite knitting store and created this. 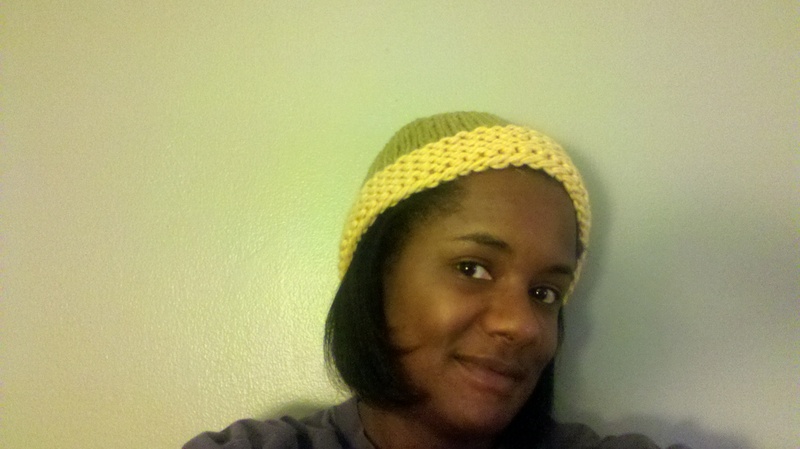 It’s my new little beanie cap. 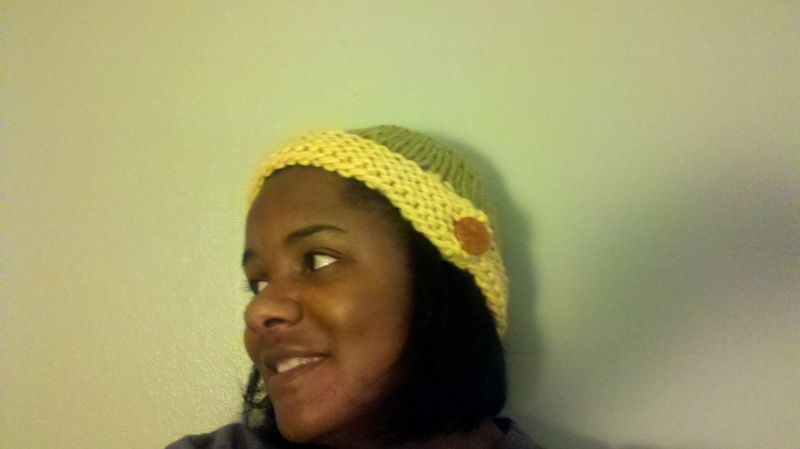 Making this one little cap involved one set of circular needles and four double-point needles. (You knitters know what I’m talking about). Easy for the pros maybe, but a little daunting for a beginner like me. But I conquered. I was so proud of my accomplishment that I had to show it off, so I went to my sister’s house after class. She loved it! So I went home and made one for her! Can you believe I did it in (only) three hours? I’m sure Julia could make this cap in, like, an hour – but I’m getting there! Check out the cute little button on one side. So watch your back, Julia. I’m catching up! Knit-off at my place!!! !